Of the Bible’s myriad stories, I see myself most clearly as the wandering son in Jesus’ parable from Luke 15:11-32. I’m currently reading Henri Nouwen’s reflection on we prodigals, “The Return of the Prodigal Son”. We rarely use that word, prodigal — it means spending money like there’s no tomorrow, spending it lavishly and wastefully. Jesus never actually names the son in his story, nor does he describe him as “prodigal,” but over the years he’s been given that name, and it surely fits. I can think of a number of sharp replies I might have made if I had been his father, but in Jesus’ telling the father’s words are never heard. He merely agrees to his son’s demand and splits his inheritance between his two boys, whereupon the Prodigal leaves for Las Vegas, or whatever the Judean equivalent was in those days. True to his name, the son starts spending his new wealth on parties and women and high living. Too soon, his money runs out. Vegas suffers a recession, and the son is forced to beg on the streets, where he isn’t even making enough to eat. The money gone, his new friends disappear and he becomes desperate — so desperate, in fact, that he begins to consider going back to his father for help. How did I get into such a mess? the Prodigal wonders. Why did I leave the comfort and security – the love – I used to know in my father’s house? “[O]ver and over again I have left home. I have fled the hands of blessing and run off to faraway places searching for love! This is the great tragedy of my life and of the lives of so many I meet on my journey. Somehow I have become deaf to the voice that calls me the Beloved, have left the only place where I can hear that voice, and have gone off desperately hoping that I would find somewhere else what I could no longer find at home. In this remarkably candid confession, Henri Nouwen speaks for me, too. There is something inside of me that cannot quite believe that God’s love is genuine, that his love is unconditional. There is something inside of me that is convinced that I have to earn his love, and tragically, that I am so damaged that I can never actually do enough to earn his love. And so I turn away from the Father whose love I doubt and go looking for love that I can touch, love that I can earn. Because when you earn something, you can be sure that it’s really yours to keep. We can only guess why the Prodigal left home, but we are certain why he came back: he remembered where love lived. He had lost everything, even his dreams, but he still held to the slim hope that his birthright might be intact. He returned to his father humbled, humiliated. His boastful, cocksure sense of his own infallibility had been buried in the muck of the pig sties where he had labored in order to eat. The painter Rembrandt portrays this emotional reunion. The son’s fine clothes have turned to rags, his lush hair has been shaven, his fine sandals are falling off his calloused feet. He kneels before his father and expects to be shamed, to be rejected, to be shunned. Yet he kneels, hoping against hope that he might receive some tiny crumb of mercy. 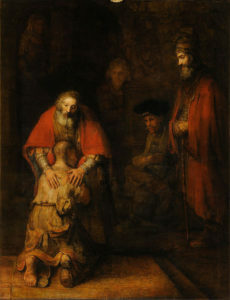 The father lifts the Prodigal to his feet and embraces him. He orders him to be cleansed and dressed while a feast is prepared in his honor. All the Prodigal can feel is the heavy weight of his sin, the embarrassment of his foolishness, the searing heat of his shame. All the father can feel is love, unconditional and boundless love for this son, who has at last returned home. The remarkable thing about this parable is not the arrogance of the son. We all know people who are blinded by their own ambition and self-interest. Nor is it remarkable that families are not places of peace and harmony, or that children compete with one another, or that wealth doesn’t buy happiness. What is extraordinary is this father’s love, which is so great that he is willing to forgive everything in order to restore his broken relationship with his son. How great is the Father’s love for us, that we who have sinned so extravagantly should be forgiven, and welcomed back into his embrace. And yet, against the evidence of our Father’s love, as demonstrated by the willingness of Jesus to take our sins upon himself, some of us are prone to wander. It’s a tragic mystery of the human heart.